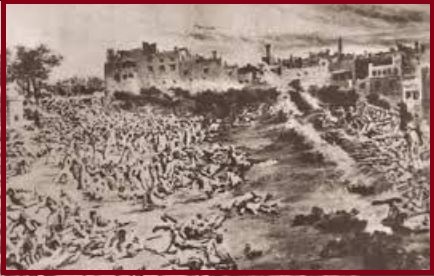 Jallianwala Bagh Massacre occurred on 13th April 1919, on this day, hundreds of people were killed by troops under British Brigadier-General Reginald Dyer, during a peaceful meeting at the Jallianwala park in Amritsar, Punjab. Jallianwala Bagh Massacre was the result of the Anarchical and Revolutionary Crimes Act of 1919, it is also known as the Rowlatt Act. This year in 2019 it marks the 100th years of this incidence and India pays homage to the martyrs of the Jallianwala Bagh massacre. The Jallianwala Bagh massacre is remembered as a "shameful scar" on India-British relations. Punjab was facing from the severe wartime depression as the sipahis were returning from Central Asia and Mesopotamia. Then the Ghadar party made Punjab a cradle of revolutionary movements. The situation in Amritsar and Lahore was worse and the army was called there. The Amritsar was handed to Brigadier. General Reginald Dyer. On 13th April 1919, in Amritsar, more than 5,000 people gathered at Jallianwala Bagh. General Reginald Dyer believed that these Indians are conspiring for a coordinated revolt in the next hot months when the British troops will be withdrawn from the plains and would be deployed in the hills. So, such a conspiracy must not be accepted. On 18th April 1919, Gandhi withdrew the movement and called it a “Himalayan blunder“. On 30th May 1919, Rabindranath Tagore renounced his knighthood. Gandhi returned the Kaiser-i-Hind Gold medal given to him for his work during the Boer War. A parallel nonofficial inquiry committee was set up by the Congress and Government also set up a committee of inquiry with 4 British and 3 Indian members. The Indemnity act was also passed. Dyer was removed from the job and sent to London, but he was never charged with any offense.